An investigation into the death of a prosecutor, due to testify against Argentinian President Kirchner, confirmed the president was wrong in saying the prosecutor hadn’t drafted an arrest warrant for her. However, there was no plan to execute the warrant. Alberto Nisman was found dead in his apartment shortly before he was due to testify before congress about his probe into an alleged cover-up by President Cristina Fernández de Kirchner in connection with a bombing of a Jewish center in 1994, which killed 85 people. Critics of the president alleged the prosecutor was killed rather than committed suicide, prompting a scandal in Argentina. News of the draft’s existence was first reported by the Argentinian newspaper El Clarin, which stated the warrant was discovered in Nisman’s trash after he was found dead from a gunshot wound on January 18. The warrant also requested the arrest of Argentina’s foreign minister, Hector Timerman, according to the New York Times. The Argentinian daily’s initial report sent shockwaves through the country, especially when Viviana Fein, the investigator in charge of looking into Nisman’s death, denied on Monday that the draft existed. On Tuesday, however, Fein issued a statement confirming the warrant was there, and said the initial denial was a mistake. She stressed she wasn’t pressured by the government to hide the existence of the document, which had been written in June 2014. According to the dead prosecutor, Kirchner and Timerman attempted to craft a deal with Iran that would have allowed the accused Iranians to avoid punishment in exchange for a beneficial trade deal. As part of his evidence, Nisman complied a nearly 300-page file of intercepted phone conversations between Argentinian and Iranian officials, and Nisman claimed the reason the deal fell apart is because officials were unsuccessful in their efforts to have Interpol remove the arrest warrants against the implicated Iranians. The draft warrant was never submitted. The Argentinian president is immune from regular criminal prosecution, which means the document would only have token value and have no legal consequences for the president. Nisman ultimately decided to call her to face questions instead. Nisman's allegations sparked uproar in the country. Prime Minister Jorge Capitanich called them “crazy, absurd, illogical, irrational, ridiculous, unconstitutional.” But opposition politicians and media outlets said the accusations were very serious and claimed that Nisman had received multiple threats before his death. 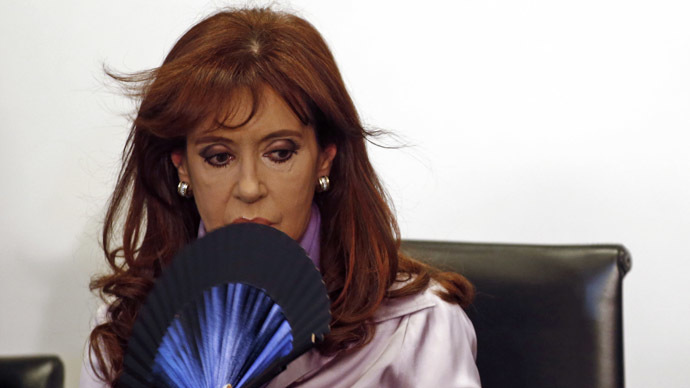 For her part, Kirchner has called Nisman’s allegations “absurd” and accused the country’s intelligence agencies of being involved in a plot against her government. She has also called for a complete overhaul of Argentina's intelligence service. “They used him while he was alive and then they needed him dead. It is that sad and terrible,” she wrote in a letter earlier this month, according to the Buenos Aires Herald.